Wow, for being so small, those are amazingly detailed. I see. Those littleuns are very nicely done though. I picked up the Thing this afternoon. I might be getting sucked in...willingly, of course, but still sucked in. I'm looking to get several of these excellent figures. I have a problem with the exclusive Hulk, though. I just don't like the design. I did notice that the Hulk shown in the back of the display stand looks different. Are there other Hulk figures? Like a true addict, I picked up the Angel on my way back from work! The Green Goblin is my next target at the store, I'll try to hold off on picking it up until Friday. I have self control, but not much! So there's a Dark Phoenix variant? Hm! Since the days of the Super Powers action figures I have displayed models like this in alphabetical order, reading left to right. (It's always fun to watch how long it takes people to figure this out. "Why isn't Robin standing next to Batman?" "Why is Aquaman first in line?") With these new figurines I'm doing the same, only in two rows, with the bad guys standing at the back. Assuming I can eventually obtain a Dark Phoenix, I wonder how close she'll end up to her "former self". It is funny the different methods folk employ to show these. We started a little fun competition to see if we could come up with a way of setting the series out so each character had a connection with the ones on either side. Not as easy as it sounds ! SILVER SURFER-Mephisto 1st appeared in Silver Surfer comic. CAPTAIN AMERICA - Ironman, as Tony Stark provided Cap A with stronger replacement shields. SANDMAN - Spideys arch rival at times. DOC OCK-was in the sinister 6 of the civil war with lizard! MS MARVEL-Is in Iron Man's mighty avengers, with black widow. ROGUE- Stole Ms. Marvels powers. POLARIS - Rouge stole both Poalris' and Havok when X-Men fight and apparently defeat a herd of Golgotha in space. ANGEL-Had a relationship with Psylocke for a long time Before Thunderbird III ruined it. THOR- It was Thor's hammer that fell through to Hell allowing Doom to escape. WASP - Founding Avenger with Thor. THING- Temporarily replaced by Luke Cage in FF when Ben lost his powers. CYCLOPS - Lost to Storm to become leader of Gold team. HUMAN TORCH - Travelled back in time with THING to stop kang taking over Camelot! GALACTUS - Made Johnny his Herald when he swapped powers with Sue. YELLOWJACKET - Hank Pym, Reed Richards & Tony Stark created a rift in the negative zone which brought back Captain Marvel to the presant day! ICEMAN - Loki messed with his powers and amplified them. JUGGERNAUT - He and Deadpool fought in an encounter involving Banshee and Black Tom. RHINO - Was persuaded by She Hulk to seek a fair trial for a crime he didnt comit! MYSTERIO - A member of the inciseous six as per the Spiderman cartoon. ELECTRO - Another member of the original Sinister Six. WARLOCK - Also a cosmically powerful being from Earth. CARNAGE - Dormammus idea to bond the symbiote to Cletus in the Spider-Man animated series. We started a little fun competition to see if we could come up with a way of setting the series out so each character had a connection with the ones on either side. A version that might keep everybody guessing would be to play that game where one person says a word and the next has to say a work that begins with the last letter of the previous word. I wonder how far I could get lining up the figurines like that. Word chains can work if you know the list of words to start with (which we do) then you list all the potential starting and ending letter groups and solve it mathematically. as for map making and planning, I think you are correct at 4 if you accept that borders which meet at a point can have the same colour. Wonder if they'll do a Yellow Daredevil? Probably not. The Black Spiderman has temporarily been removed from sale in the UK due to a quality control issue. My opinion is that these figures fall over fairly easily and the outstretched hand gets damaged in the process. IF you do buy off ebay ask the seller to confirm that the figure is in MINT condition and that they specifically check the hand for bent fingers and/or paint chipping. If they say it is fine then you will at least have some come-back if it transpires it is one of the many damaged ones on the market. Hope that helps you avoid disappointment. Next batch of 5 is up. Must get Super-Skrull! The others aren't so bad either! but otherwise --- there goes more of my money! Soooo....blow out sale on commissions? Will work for lead miniatures? Dunno, if JB is into the bartering system. Hm. The figures I've seen run about $10 a pop. One smallish commission would require more than have actually be produced so far! 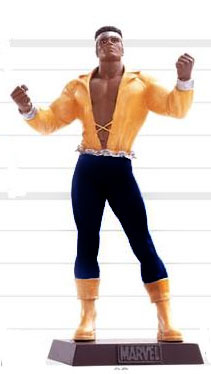 The Luke Cage figure looks like an effeminate Carl Lewis. Black pants may help it look better. I'd really love to see this company tackle the DC characters. They would have my money in a heartbeat. Sweet Christmas! It works for me. 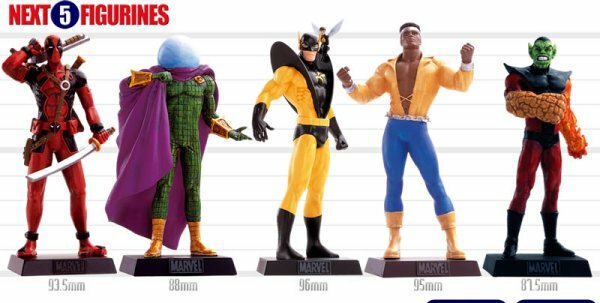 I recently sold almost all of my Bowen Busts (kept Hawkeye and Luke Cage....still have a Black Widow to sell), but I gotta tell ya, the more I see of these little gems, the more tempted I am to get into collecting them.